The outcome of cardiopulmonary resuscitation (CPR) after traumatic cardiac arrest is very poor. Moreover, some consider laparotomy for abdominal trauma after CPR futile. 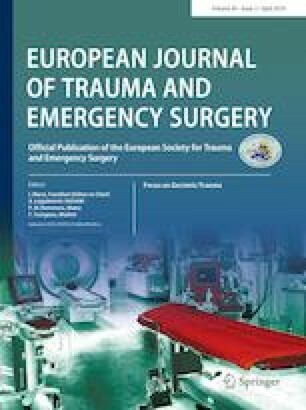 This study aimed to investigate the outcomes of trauma patients who were pulseless and received CPR followed by laparotomy. We conducted a retrospective review of 28,255 trauma patients from our hospital from January 2009 to November 2017. Patient demographics, injury severity scores, duration of CPR, operative data, and mortality of patients with laparotomy after CPR were collected and analyzed. We identified 120 trauma patients (0.42%) who underwent CPR at admission. Twenty-three patients (0.08%) underwent laparotomy following CPR. Of these, 19 patients (82.6%) died after laparotomy. Of four survivors after laparotomy, three (13.0%) survived with a good neurologic outcome. One survivor required rehabilitation due to poor neurologic outcome. All patients had suffered a blunt injury. The survival rate for laparotomy following CPR after traumatic cardiac arrest was very poor. However, laparotomy following CPR is not always futile. Wu Seong Kang, Yun Chul Park and Young Goun Jo declare that there are no conflicts of interest.